Nuthall Temple was built in 1754-7 for Sir Charles Sedley, MP for Nottingham, by Thomas Wright, the landscape gardener, architect and astronomer. He shaped many gardens and parks for his wealthy patrons embellishing them with romantic arbours, discreet grottoes and mock castles. 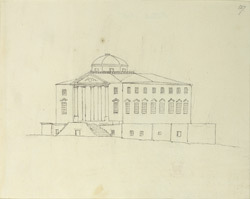 The design of the temple was based on La Villa Capra, a Palladian villa near Vicenza, Italy. Italian craftsmen decorated much of the interior, particularly the great domed hall, thereby adding extra authenticity to the building. It is said that Sir Sedley paid for the house with the winnings of a single horse-race! Unfortunately, this gem of 18th-century extravagance was pulled down in 1929.